"the spark that fires the soul…"
Just under two years ago the Israeli keyboardist Idan Raichel and the Malian guitarist Vieux Farka Touré came together for one day after a performance the night before, which had inspired them to want to record something in the small window of opportunity they had. There were no major expectations of the session, Vieux’s manager Eric Herman of Modiba thinking “alright, this is fun, a nice little jam”. They sat down in a small recording studio in south Tel Aviv set up like a living room and recorded whatever came to them. Accompanied by Israeli bassist, Yossi Fine and the Malian calabash player Souleymane Kane the four musicians played for just three hours. After the first three pieces, Herman was thinking “Maybe there will be something here we can use”. Five or six numbers later there was enough for an entire album. It also became clear to the participants that something special was occurring. Herman describes it thus: “Because there were no expectations, it was really the most fluid and pleasant recording experience. They all just played until they got tired. … What struck me was the nakedness of it. So many people agonise over all the aspects of a recording, everything is premeditated in virtually all recording sessions that I’ve been to. And this was entirely freeform - an open exchange”. "acoustic, spontaneous and entirely improvised." The result of this Tel Aviv session is the basis of this album - acoustic, spontaneous and entirely improvised. And it’s a keeper. After the initial edits it was decided to add certain elements and musicians to accentuate the pieces already recorded and so invitations were sent out to members of the Idan Raichel Project (Idan’s main band) such as Yankele Segal who added the long-necked Persian tar on “Kfar”, and Cabra Casey (an Ethiopian Israeli) who wrote lyrics for and sang on the final song “Ane Nahatka”. Mark Elihyahu (originally from Dagestan) contributed the kamanche (the Azerbaijani fiddle) to “Alem” and Frederic Yonnet the blues harmonica to the track “Touré”. As well as this, Vieux recorded vocals for “Alkataou” and his bassist friend Patrick Ruffino sat in as well. So how to describe it? The album is mostly instrumental, subdued, gentle but rocking, trance-like with no immediately obvious structure. Kane and Fine set up mesmeric rhythmic bases upon which Raichel and Toure then proceed to add layers of instrumentation and gently unfolding solos on top. It’s quite beautiful. "ambushing your ears when you least expect it." The first two tracks “Azawade” and “Bamba” have a similarity in the sway and lilt of their rhythms - a particular pulse dictated by the constant return to the 1 on the bass and driven by the clacking 1+2+3+4+… of the calabash. 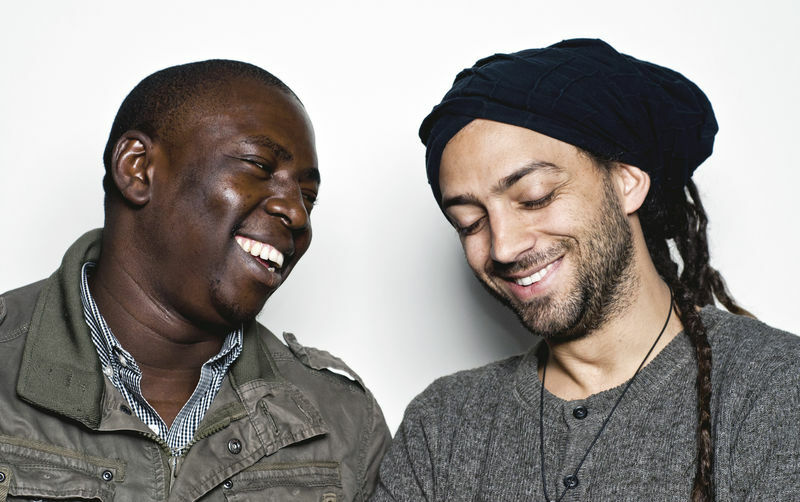 Raichel’s piano swirls and sloshes around like water, or sometimes little breezes or gusts of wind; at others it gently pulses in the background, whilst Touré’s guitar jangles and buzzes in front, occasionally ambushing your ears when you least expect it. The third track “Experience" has a slightly darker, more insistent, even urgent edge to it. Following this there are Vieux’s vocals on “Alkataou” and then a bluesy guitar driven number entitled “Hawa” with understated keys (although I liked the strummed piano strings and struck piano housing in places - reminiscent of Piazzolla’s approach to tango). "Full of energy, vitality and groove"
“Kfar” which features Yankele Segal on tar, is another of those dreamy, elegant pieces, which just ebbs and flows. For me the next track, the very bluesy “Touré”, is one of my favourites from the whole album. Full of energy, vitality and groove it really benefits from Frederic Yonnet’s gutsy and highly expressive harmonica which instantly reminded me of the late Dr Ross. Wonderful! "lazy as a meandering river yet full of rich, creative silt." “Le Niger” and “Ai Houde Bakoi” are once more very contemplative offerings, as lazy as a meandering river yet full of rich, creative silt. The latter features Touré and Kane on their own. “Ane Nahatka” is one of only two songs on the album and features Cabra Casay who sings the lyrics in the Ethiopian language, Tigrit. It’s a simple catchy tune with some lovely electric guitar and interesting keyboard sounds. "wistful piano twirling like a solo ballerina"
As hinted at above this is not a ‘normal’ album - it’s a recording of a jam session essentially - and this explains a certain uniformity of mood and tone throughout, something which is both its strength and its weakness. Strength because it ties it all together - the exploratory nature of the numbers, the calm, the ebb and flow of musical ideas and motifs; weakness because I occasionally wanted something that stood out as quite different from rest - more light and shade between tracks (even though there is plenty of light and shade within each track). However, as I’ve listened to the album again and again, this seems less and less important. There’s far more here than meets the ear at first. It is definitely one of those works that repays renewed listenings as you begin to notice fresh layers revealing themselves, new juxtapositions of sounds and melodies, conversations you might have missed… It is one for quiet reflection, for mood immersion and musical absorption. You need to spend time with "The Tel Aviv Session". Don’t expect it to reveal all its secrets at one. But if you have the patience it’s well worth the digging. There’s gold in them thar hills. Vieux Farka Touré, in my opinion, is better on this album than on his last one (“The Secret”) - he just feels infinitely more relaxed and liberated. All the musicians are excellent and feel very comfortable with their parts. But it’s Idan Raichel’s influence that I’m enjoying the most of all. With a free-ranging mind and countless musical colours he appears completely in control of his instrument and it becomes a direct expression of his musical will. I love that in a musician. In fact, he reminds me in that sense of the Japanese pianist Ryoko Nuruki. "Pour yourself a glass and sit back." Pour yourself a glass and sit back. Toure-Raichel Collective - The Tel Aviv Session (CMB-CD-22) is released today Monday 3rd September 2012.